The new 91m² ultrafiltration module and the Variable Connect Concept™ - VCC provides several options for assembling the modules. The standard module setup with a radial feed and axial concentrate port supports a multitude of operating modes without restriction of rack size. In addition to dead-end operation, this module assembly allows your system to treat a broader range of feed water qualities. A slow cross-flow can be applied to promote shear force and limit membrane fouling. All endcaps are designed to fasten the entire modules to a skid or to connect it to other modules. 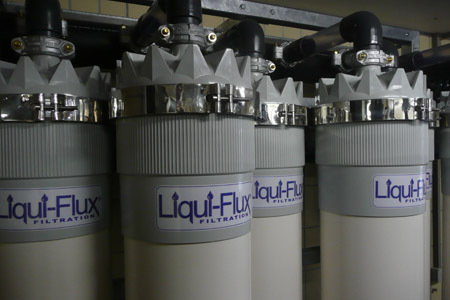 When a compact module assembly for small to medium systems is necessary, Liqui-Flux modules can be supplied with a radial concentrate port for installation where height restrictions are important such as in containerized systems or basement installations for swimming pools. All endcaps are designed to fasten the entire modules to a skid or to connect it to other modules. Wherever a reduced footprint is required, Membrana's high surface area module can be supplied with an axial feed port, providing the opportunity to arrange the modules in a small footprint. When the footprint is minimized in an optimized rack design the manifolds are directly arranged onto and beneath the modules using commercially available parts.